Committed to delivering comprehensive emergency medical services for both adults and children, JFK Emergency Room Palm Beach Gardens offers a convenient, comfortable, and welcoming atmosphere with minimal wait times and 24-hour access. Board certified emergency physicians are committed to providing patients with the highest level of care and personalized attention. JFK Emergency Room Palm Beach Gardens provides the same emergency treatment that patients receive at its hospital-based emergency room. The multidisciplinary team of care givers is comprised of nurses, respiratory therapists, radiology and laboratory professionals, and pharmacists. The 10,000 square-foot facility houses eight private treatment rooms, one trauma room, and one triage room. Additionally, the facility includes a full-service laboratory, a pharmacy, and advanced Imaging equipment including a 16-Slice CT, Ultrasound and two X-Ray units. 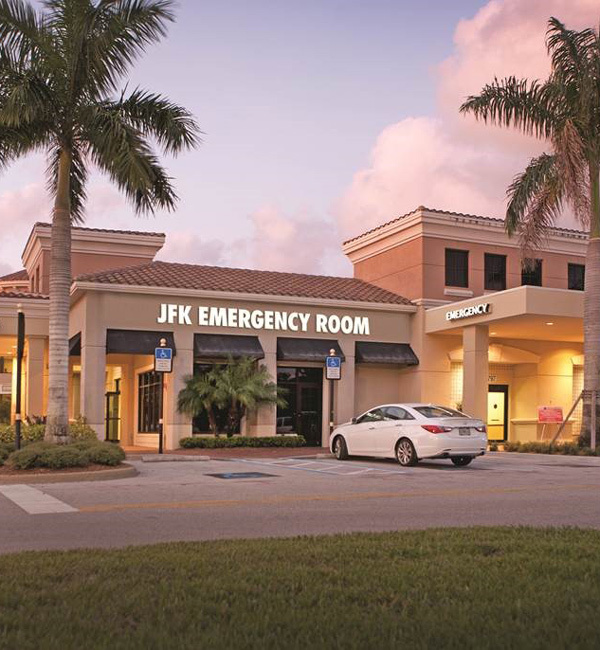 JFK Emergency Room Palm Beach Gardens is an extension of JFK Medical Center, which accepts most private insurance carriers.